Just as a frame of reference, my first book Who's Been Sleeping in My Bed(room)? Researching a St. Louis County, Missouri Home was printed here in St. Louis and is available on my website and in local bookstores and gift shops. From Buckeye to G.I. 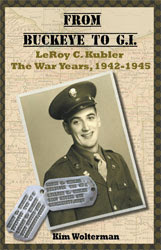 LeRoy C. Kubler The War Years, 1942-1945 was uploaded to Lightning Source, which then prints the books as they are ordered and also distributes the books through Ingram. 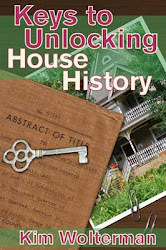 My ebook Keys to Unlocking House History was produced through Smashwords, but because Amazon does not play well with others I also uploaded it through Kindle Direct Publishing to make sure that it could be sold on the Amazon website. While Amazon does show all three of my books if you enter my name in their search engine, my house research book is essentially unavailable and my WWII book says that it will ship in one to three weeks. In this age of instant gratification, a delay in shipping equates to a lack of sales. I have been thinking about how to resolve these issues. In doing research on the Lightning Source versus CreateSpace issue, it appears that I can go ahead and upload the PDF of From Buckeye to G.I. to CreateSpace and have it sell from there in addition to Lightning Source. There are trade offs with both companies, but it seems prudent to have the book in both locations. I guess the biggest issue will be whether the original PDF, which was formatted by the designer for Lightning Source, is also acceptable to CreateSpace. I won't know until I upload it. I am keeping my fingers crossed on that one as I do not wish to go back to the designer I used. I have never been overly concerned that Who's Been Sleeping in My Bed(room)? is not for sale on Amazon. Because my audience is limited to the St. Louis area, it didn't seem to be that big of a deal. But I am rethinking that stance. For now I think I will start with From Buckeye to G.I on CreateSpace and see where that takes me. On September 8, 2012 from 9:30-11:30 a.m. Linda Austin and I will be doing a workshop at the Brentwood Community Center entitled Blogging for Authors. The purpose of the meeting is to help authors understand the purpose and importance of a blog, discuss different blogging platforms, give examples of blogging topics, and illustrate how to attract an audience. Originally Linda and I were going to offer a workshop on Twitter, as a lot of the attendees at a recent social media event held by the St. Louis Publishers Association seemed to be perplexed by the topic. But then it seemed to make more sense to begin at the beginning. When someone is interested in you on Twitter, they want to be able to check out your blog. If you have no blog, well...they just go away. So we are starting with blogging and will see how it goes. We are limiting the workshop to 15 attendees, and they must be members of the St. Louis Publishers Association to attend. The cost is $15 to cover the room rental and miscellaneous expenses. I believe we have 7 or so folks signed up already, and the email regarding the event just went out on Monday. The timing on this is pretty good as there is a WordCamp coming to St. Louis later in September. If any of our attendees decide to go with the Wordpress platform for their blog, this would be a great followup meeting for them. A while back I was asked by Danyelle Little, aka The Cubicle Chick, to be a speaker at the Show Me the Blog conference in October. I can't believe I have not blogged about this before now. I think it is because speakers were offered a badge to put on their websites to show that they are speaking at this event, and I have yet to be able to figure out how to get Blogger to accept the badge. Techy, I am not! Obviously I was able to figure out how to copy and paste the image here, but it's not quite the same thing. At any rate, as someone who has attended the past two Show Me the Blog meetings (you can find my review of last year's sessions here) and been blown away by all the great information imparted, I was thrilled to be asked to present. Danyelle would like for me to talk about how to turn a blog into a book. While I haven't precisely taken what I have blogged about and published it into a book, I did begin to blog about my book's topic (how to research the history of a house) before my first book was written. And I certainly know a lot about book publishing by this point. I think I have a lot to share, and am excited for this wonderful opportunity. You can find my Featured Speaker interview with Danyelle here. Wholesaler or Distributor - Which One Do You Need? Barnes and Noble wants to purchase copies of a new book written by a friend of mine. Great news, right? The only problem is that they want him to go through a wholesaler or distributor in order to get the books into their stores. They sent him a list of companies that they are working with so that he could select one. This led to a discussion about the differences between a wholesaler and a distributor. In a nutshell, using a wholesaler enables publishers to get their books into most traditional bookstores, online retailers and libraries. They essentially receive and process orders. The wholesalers keeps supplies of books in their warehouses and mail them to retailers and libraries. On the other hand, a distributor gets books into the hands of wholesalers in addition to bookstores, online retailers and libraries. Distributors also handle the storage and shipment of books. Additionally the distributor employs a sales staff to assist in the marketing efforts of its publishers. Unlike wholesalers, distributors often require an exclusive arrangement from their publishers. So how do these two entities make their money? Wholesalers make their income by buying books from publishers at a high discount and selling them to their customers for a slightly lower discount. A wholesaler may require a 50-60% discount off the list price of the book, which means the publisher receives 40-50% of the list price. In turn the wholesaler may allow bookstores 40-45% off the list price. Libraries may be offered 20-33% off list price. Book distributors derive their income by taking an overall percentage (normally 25-30%) of the retail selling price. That may work out to 67% off the list price, leaving the publisher with 23% of the list price. Both of these result in less income per book for the publisher. Because distributors are doing some marketing of the books, the publisher realizes less income in that arrangement than a wholesaler agreement. So does it make sense to enter into one of these agreements? If your book is of regional, national or international interest, you may want to consider these options. Many bookstores will not deal with individual authors or publishers, so if you want your book(s) in bookstores and/or libraries you may have no choice. While you are giving up a pretty substantial portion of list price on each book, using a wholesaler or distributor opens up many new marketing opportunities for you. Additionally they deal with getting the books into the markets, billing and collection of any moneys due, and shipment of books. Trying to do all these tasks on your own can be overwhelming. As with all things in this brave, new world of publishing do your research on the companies before signing any contracts. There are a lot of unscrupulous folks trying to take advantage of authors and publishers right now.